A few weeks ago I went to Ottolenghi’s new restaurant, ROVI, with some friends. We all had some delicious drinks to start and their gin sour cocktail had caught my eye – my mum had mentioned it to me as she’d been to the restaurant previously. 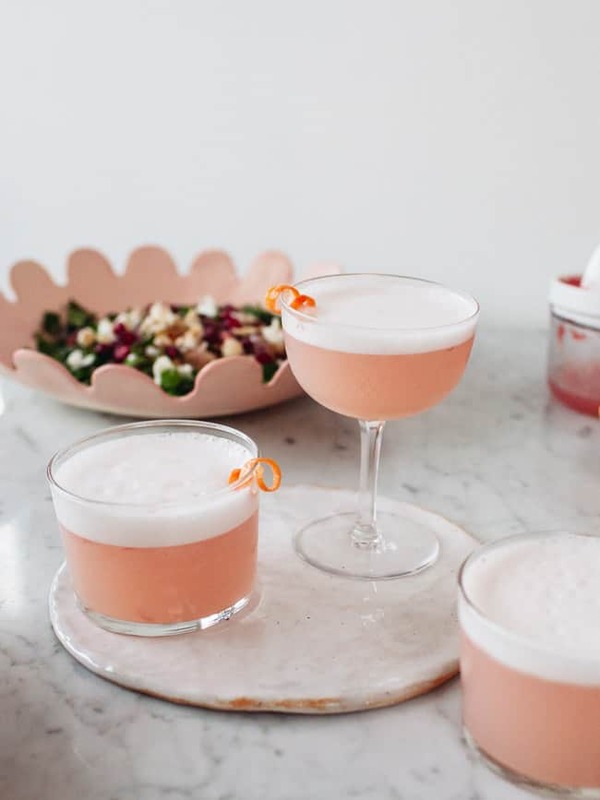 In a standard sour cocktail, an egg white can be shaken with the booze and some acidic ingredients in a cocktail shaker so that the egg froths up into a creamy foam. As the drink is poured into the glass and left to settle, the liquids drop to the base of the glass and the foam creates a frothy head. This helps mellow it all out and adds a nice texture. At ROVI, instead of using egg white, they’d made an aquafaba* gin sour cocktail for the froth. It was a genius move because a) the cocktail was now plant-based and b) the chickpea juice normally wasted in the kitchen was being used for something cool! We’d been wanting to try them out at home for some time so finally did it this week while I was at my parent’s. 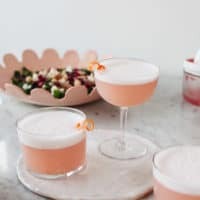 I’m not much of a whiskey drinker so we stayed on the gin sour route made an aquafaba gin sour cocktail (and added some grapefruit juice for a simple twist). I wasn’t sure the aquafaba would whip up if it was mixed with the liquids in the shaker so the first time we tried it, mum shook the aquafaba separately with ice and spooned it onto the drink. The next time, I just poured it all into a shaker and went for it! It worked! A nicely thick, creamy froth for the top of the drinks – perfect for a New Year’s Eve drink!! 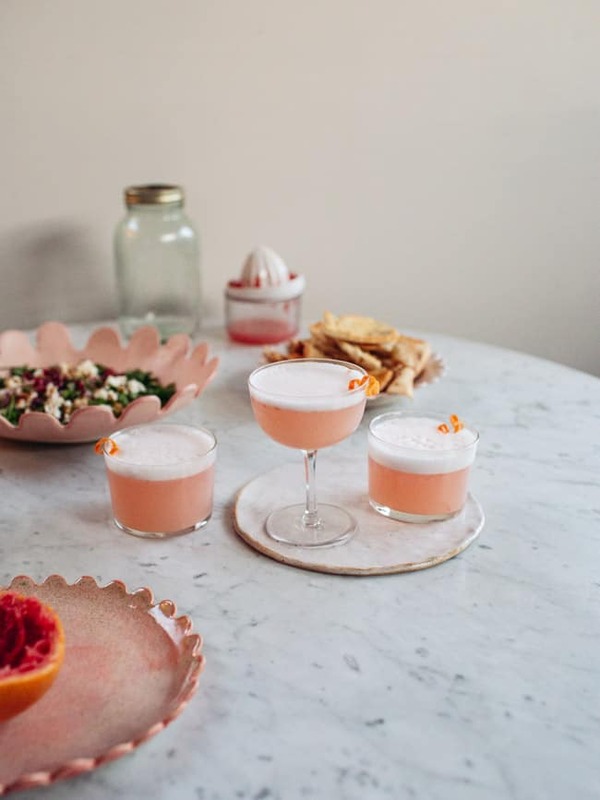 I thought it would be good to pair the drink with the chickpea dip recipe (from my first cookbook) so that we’d have an immediate use for the chickpeas left from using the aquafaba. It’s a great pairing with the cocktail too with the fresh herbs and tangy pomegranate molasses. If you are vegan/dairy-free then skip the feta on top! Combine all the ingredients in a cocktail shaker with a few ice cubes. Put the lid on and shake well until super frothy - about 30-40 seconds. Strain into a glass and serve. 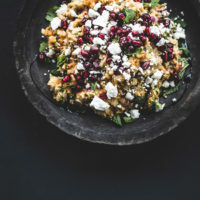 Place the chickpeas, oil, pomegranate molasses, salt and pepper in a blender and pulse briefly until combined but still slightly chunky (alternatively, place them in a large bowl and mash using a potato masher or fork). 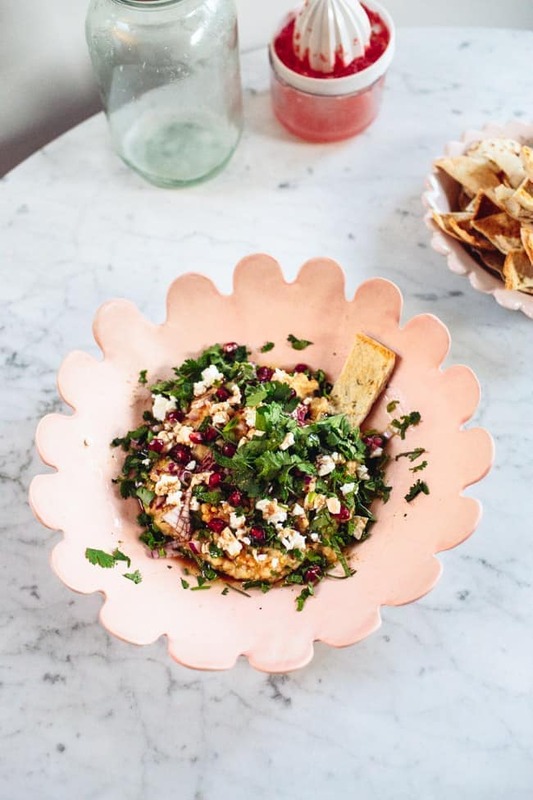 Transfer to a bowl and stir in the rest of the ingredients, reserving a little feta and some of the pomegranate seeds. 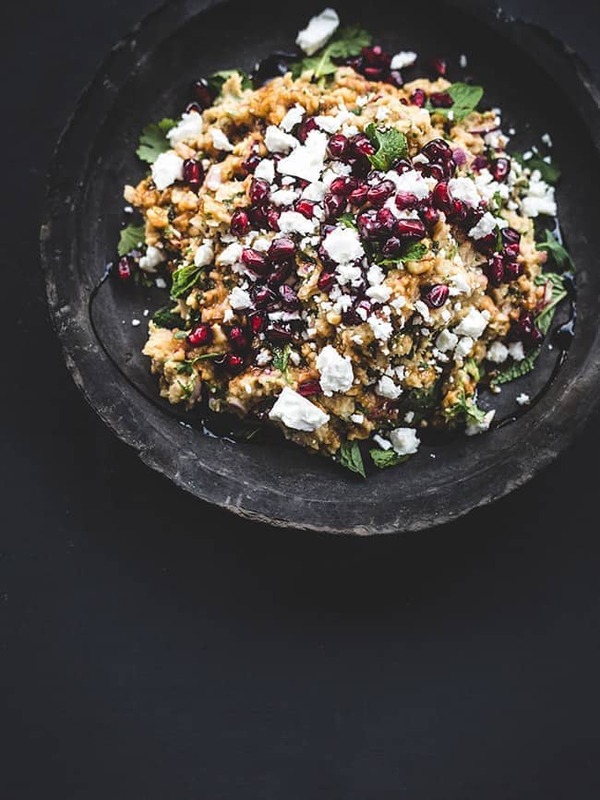 Drizzle with extra pomegranate molasses and serve with the reserved pomegranate seeds and feta scattered on top. 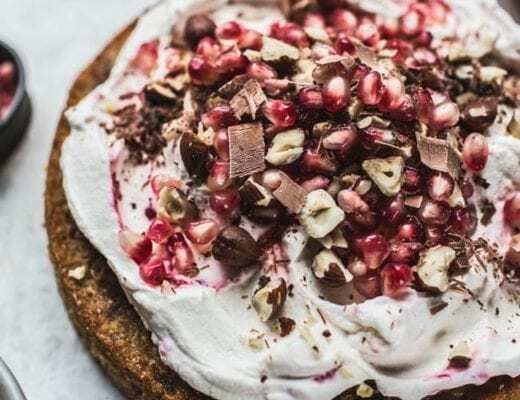 If you can't get pomegranate molasses, try using a shop-bought balsamic 'glaze' or a super thick balsamic vinegar instead. By the way – you can also make your own glaze by reducing some balsamic vinegar with some sugar or honey on a low heat for a couple of minutes until it becomes thick. 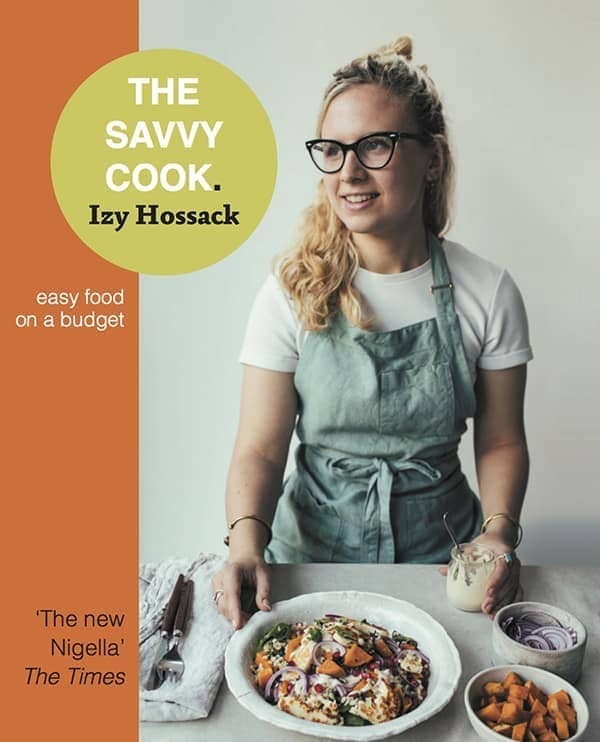 Ah yes, it was re-printed with a new title ‘Everyday Delicious’ which is why the Top with Cinnamon version is rarer! The dip is seriously one of my favourites to make for friends, everyone LOVES it and it’s a bit more interesting than hummus. So glad I read this just before going for grocery shopping. Gonna try it for dinner tonight. I also checked your vegan molten chocolate cake and oh my they look delicious!